1. Laurent Linn's job seemed too large and overwhelming for my little mind to comprehend. 2. 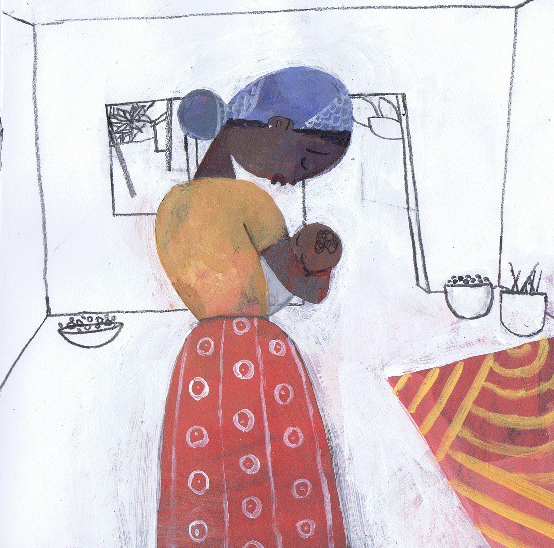 When Laurent Linn showed us the work of Sean Qualls, I immediately scribbled his name down and circled it repeatedly. His work was so rich in texture and had such graphic shapes, I couldn't resist it. Not only is Sean gifted in illustration but also as an upcoming author/illustrator! 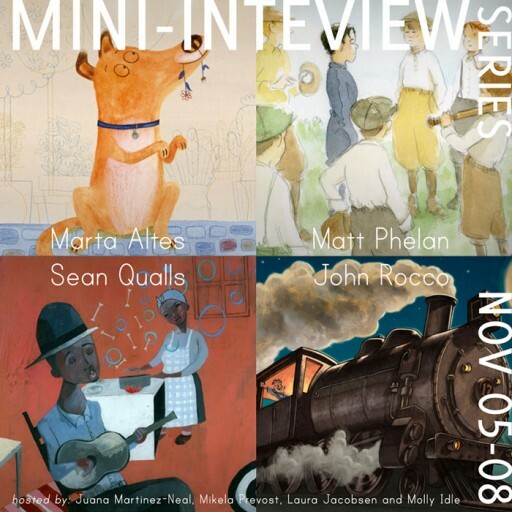 He has been so kind as to share his process in my first "Mini-Interview". Work, work, play, play, work. Which books, that were your favorite when you were little, have had the greatest influence on your work? 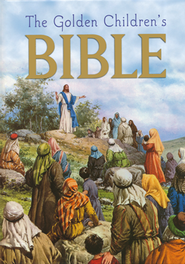 In terms of themes, Golden's illustrated Bible for Children and D'aulaires Book of Greek Mythology. As for art, I like the comic book art of Bill Sienkiwicz. Please share an instance in which you had an idea or experience that started out small, but took root and grew to become a book. My first book as author/artist (pub date to be determined.) A while ago I did a color sketch of a jazz singer. I kept it on my art table for a long time. My agent helped me to create a manuscript based on that sketch. In the beginning of Dizzy there's a scene where Dizzy is being bullied by two other boys. Since that was a reality for me when I was a kid I used the name of street I grew up on in the art. Often times I'll use my home as inspiration for interior scenes. For instance, I used my kids room in the opening pages of Lullaby. Sometimes a self-portrait may show up. Daily routines are important for both writers and illustrators. Could you describe your typical work day, and tell us the one little thing you absolutely cannot begin your day without (besides caffeine)? After getting my kids off to school, I spend some time (usually in cafes) journaling/self reflecting. I also use that time to figure out what projects to spend my time on that day/week. Green tea is my drink of choice. Your work seems to have a definite love of texture and color-do you build up abstract layers until you feel you've achieved the right color/texture combination for that particular illustration? Yes. It can be a very fulfilling process getting the color and texture just right - other times more challenging. Recently, I've been changing my approach at least for some of my work. I'm always trying to find new ways to keep making art fun and interesting. Most of the art I love combines a strong graphic sensibility mixed with abstraction and textural elements. 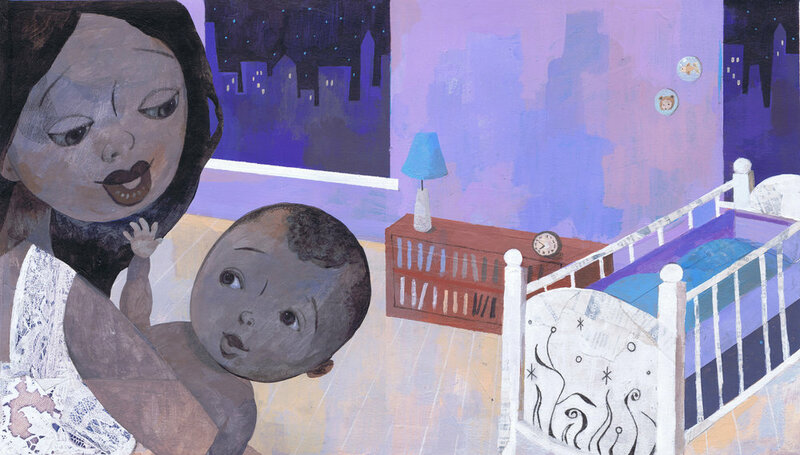 Sean Qualls is an award winning, Brooklyn-based, children’s book illustrator, artist and author. 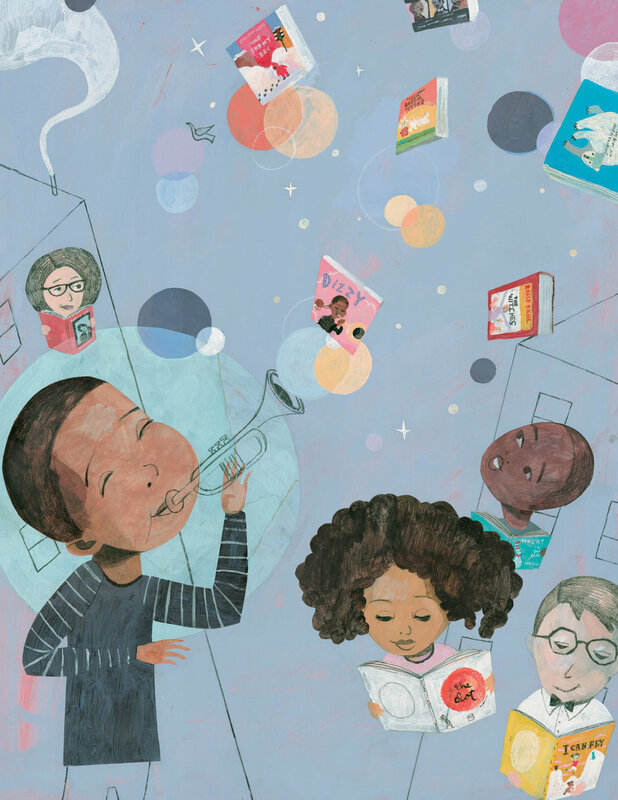 He has illustrated a number of celebrated books for children, including Giant Steps to Change The World by Spike Lee and Tonya Lewis-Lee, Little Cloud and Lady Wind by Toni Morrison and her son Slade and Before John Was a Jazz Giant, for which he received a Coretta Scott King Illustration Honor. Sean also created the art for Dizzy by Jonah Winter and most recently Freedom Song (The Story of Henry “Box” Brown) by Sally Walker. His work has received two Blue Ribbon citations from the Bulletin of the Center for Children’s Books where he was also cited for his “serious craftsmanship” and an “original style.” Qualls has created illustrations for magazines, newspapers, and advertisements. His work has been shown in galleries in New York and across the country. Sean draws inspiration from an array of influences such as movies, television, childhood memories, aging and decaying surfaces, architecture, old buildings, nature, folk art, fairy tales, Americana, black memorabilia, outsider art, cave paintings, collectibles, African art, golden books, vintage advertisement graphics, psychology, mythology, science fiction, music, and literature. 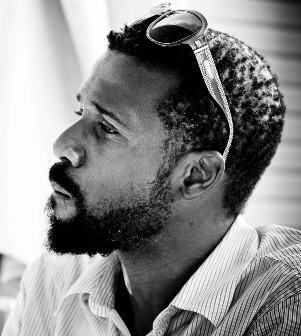 He lives in lives in Brooklyn (where you can find him DJing on occasion) with his wife, illustrator/author Selina Alko and their two children Ginger and Isaiah.